Here all of you get excellent projects on PIC microcontroller for ECE/EE/CSE STUDENTS. Those all project are working fine and tested by me and you can easily submit it at your final year project work. 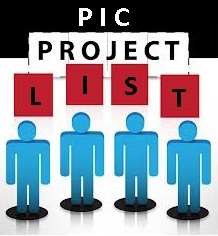 In bellow I give list of projects, select as you like, click on that and see the detail description of project with complete embedded C code. These all projects are created by me so if you face any difficulty then you can get my support. Only thing I want your feedback regarding those project then only my hard work get some reward. From what I can see and change is necessary.